"My little son, there are many I could send. But you are the one I have chosen." She then told him to return the next day to the bishop and repeat the request. On Sunday, after again waiting for hours, Juan met with the bishop who, on re-hearing his story, asked him to ask the Lady to provide a sign as a proof of who she was. 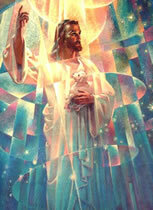 Juan dutifully returned to the hill and told Mary, who was again waiting for him there, of the bishop's request. Mary responded: "My little son, am I not your Mother? Do not fear. The Bishop shall have his sign. Come back to this place tomorrow. Only peace, my little son." "Do not be distressed, my littlest son. Am I not here with you who am your Mother? Are you not under myshadow and protection? Your uncle will not die at this time. There is no reason for you to engage a priest, for his health is restored at this moment. He is quite well. Go to the top of the hill and cut the flowers that are growing there. Bring them then to me." "My little son, this is the sign I am sending to the Bishop. Tell him that with this sign I request his greatest efforts to complete the church I desire in this place. Show these flowers to no one else but the Bishop. You are my trusted ambassador. This time the Bishop will believe all you tell him." 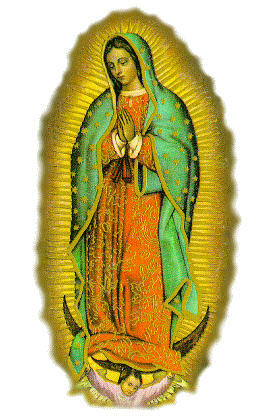 "Call me and call my image Santa Maria de Guadalupe." 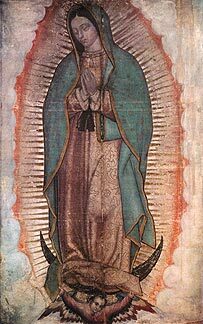 It's believed that the word "Guadalupe" was actually a Spanish mis-translation of the local Aztec dialect. The word that Mary probably used was Coatlallope which means "one who treads on snakes"! Within six years of this apparition, six million Aztecs had converted to Catholicism. The tilma shows Mary as the God-bearer - she is pregnant with her Divine Son. Since the time the tilma was first impressed with a picture of the Mother of God, it has been subject to a variety of environmental hazards including smoke from fires and candles, water from floods and torrential downpours and, in 1921, a bomb which was planted by anti-clerical forces on an altar under it. There was also a cast-iron cross next to the tilma and when the bomb exploded, the cross was twisted out of shape, the marble altar rail was heavily damaged and the tilma was...untouched! Indeed, no one was injured in the Church despite the damage that occurred to a large part of the altar structure.
" . . . 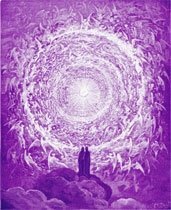 Even as I speak, there are those who would rather gravitate to My message of long ago as though it were a great event never to come again, a prophecy if you will, long past, instead of holding fast to the Inner Voice of the Mother's Flame that resounds throughout the Earth to wake up - wake up mankind and know who you are. The Mother's Light will be veiled until such time as there are those who desire to be their God Presence in action. And where that vibration is present, where that desire is present, the Mother's Light will raise high into the Heart and bring forth the creation of the Golden Age. The Light of the Mother is as close as your God Presence, but many do not realize that the Light that is within their Heart is the key to open the Door. . . . "